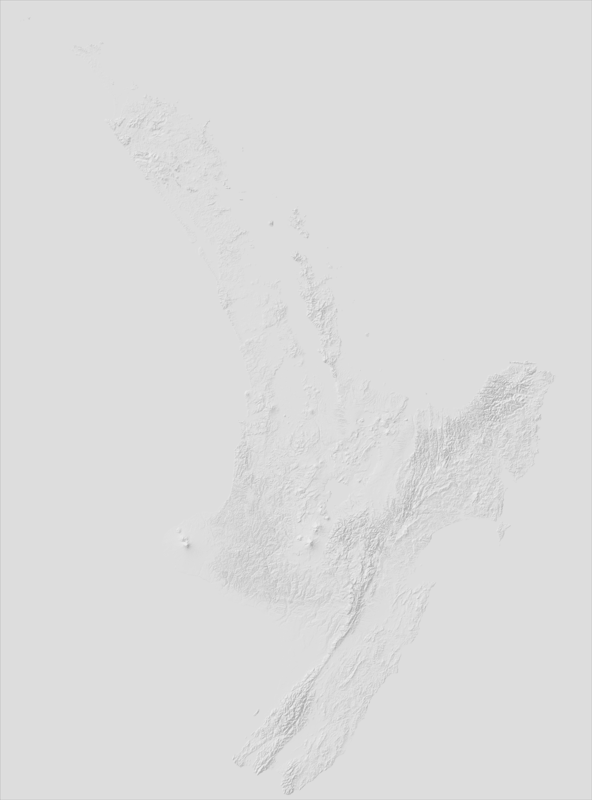 After creating a shaded relief map of New Zealand's seafloor, and it's time to move onshore. I'm going to use the same slope-enhanced hillshade technique. It was a bit tricky, but I think I've found a workflow that works. 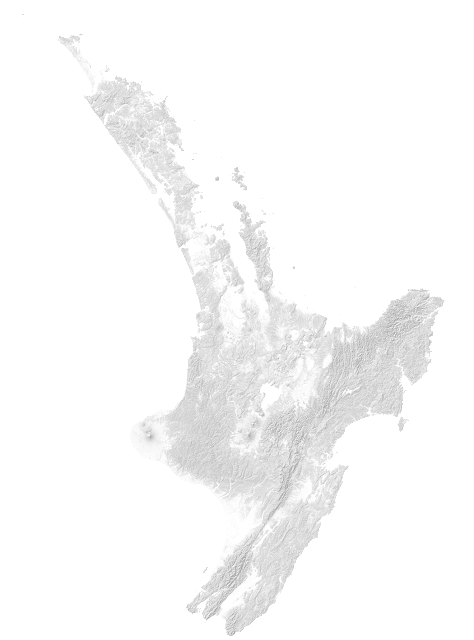 While we got a 250 meter resolution Digital Elevation Model (DEM) of New Zealand's seafloor, you can download a 25 meter resolution DEM for the North and South Island from Landcare Research. The free datasets are available from the LRIS portal, where you can also read about the accuracy of the data. I got an invitation to visit Landcare Research when I was passing through Palmerston North. They do a lot of open source stuff, and they have some exciting projects going on! Wellington seen from the Geographx office and studio in the old Dominion Observatory. 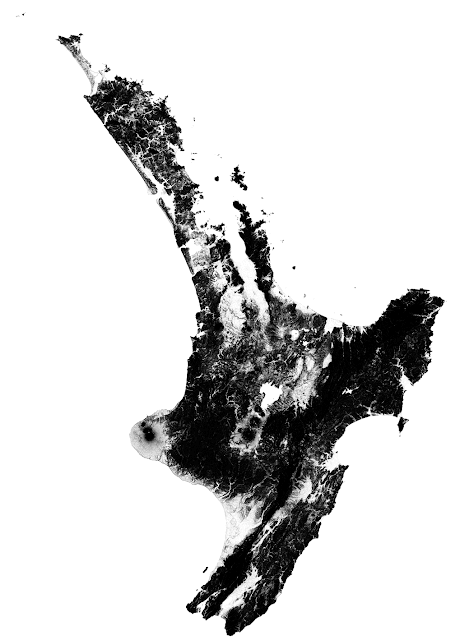 Let's move on with our elevation model from Landcare Research. I first tried to merge the two DEMs for the North and South Island, but I ran into memory problems at a later stage because of the high resoltion. The commands below are covering the North Island, but the same set of techniques applies to the South Island DEM. I downloaded the GeoTIFF version of the datasets. At the same time I'm downscaling (-tr) the dataset so it has the same resolution as zoom level 11 in the widely used Web Mercator tiling scheme. Where do I get this 76.4370282745361 number come from? So to cover the world at zoom level 11 you need almost 4.2 million tiles, and it becomes 4 times more for every zoom level you add to the party. 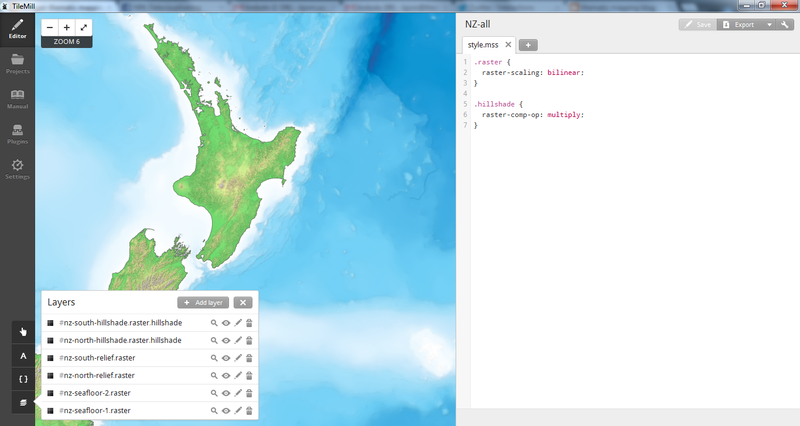 Luckily we're only mapping a small part of the world, New Zealand. Web Mercator consider the world to be a square, 40,075,016.68 meters wide and tall (the length of the Equator). With a tile size of 256 pixels you get the a maximum resolution of 40,075,016.68 / 256 = 156,543.03390625. You get the map scale by dividing the resolution by 0.00028 (pixel size). The rest is simple math. The scale is only correct at the Equator. For 41° south latitude, running through the Cook Strait between the North and South Island, the map scale for zoom level 11 should be around 1:360,000 if my calculations are right (multiply by 1.325). Read more about the map projection and tiling scheme here. I think the "Slope-Enhanced Shaded-Relief" technique by Kent D. Brown gives a better definition of the steep terrain. I have posted a few samples here. I'll try the technique on my Jotunheimen map when I get back to Norway. 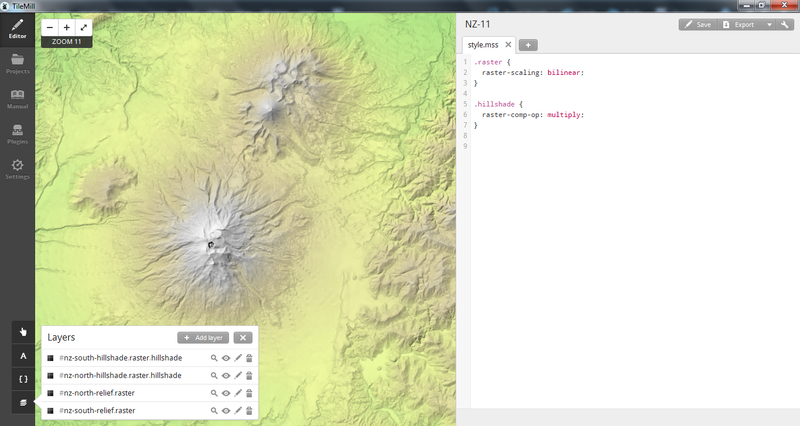 Just a quick observation, I think the hillshade and slopeshade layers are reversed in the mapnik XML file in the post. Glad you had a great time over here!